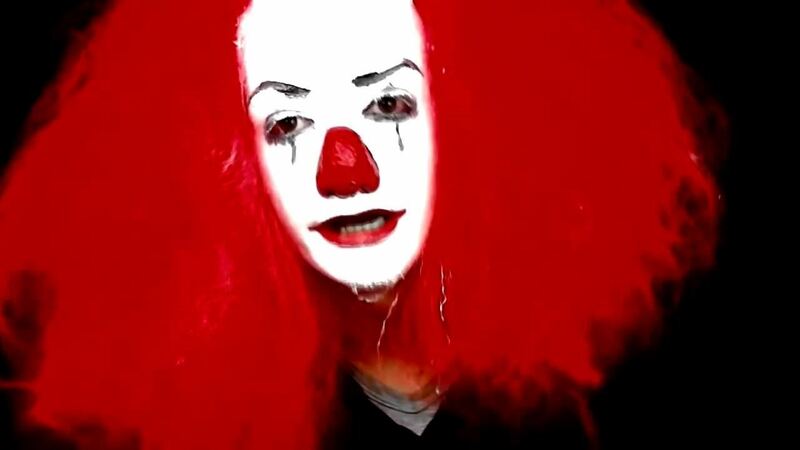 Considering Pennywise is so popular, though, you can bet that there are going to be a whole bunch of clowns slapping on some white face paint and red noses for Samhain. 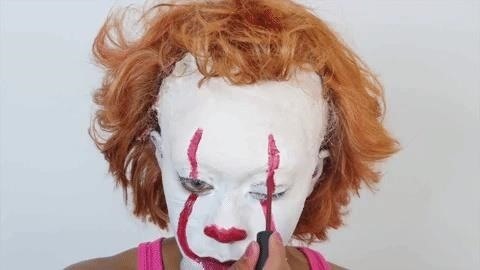 To help you stand out in the sea of creepy red and white faces, we've broken down not one, but two of the best Pennywise tutorials on the internet. 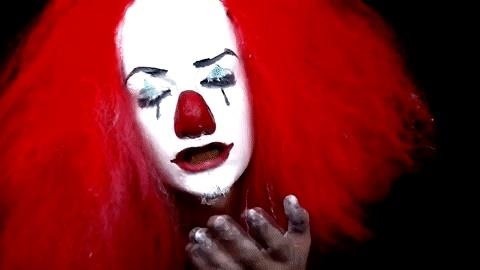 If you're in a hurry or just don't want to bother with all the details, you can use BaptismOnFire's costume tutorial for the Tim Curry version of Pennywise from the '90s TV adaption of Stephen King's horror novel (make sure to refer to yourself as "OG Pennywise" if you find yourself standing beside another Pennywise at a party). Here's what you'll need to get started with the video above. Step-by-step instructions are also provided below to help you out, just in case you're not much for videos. 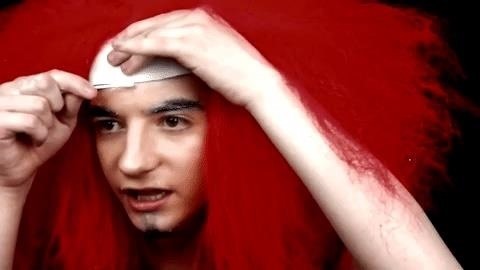 Put your wig on so that you don't have to apply anymore face paint than necessary. Using a cotton swab, apply liquid latex to the edge of the wig cap so that it blends in seamlessly to your actual forehead. 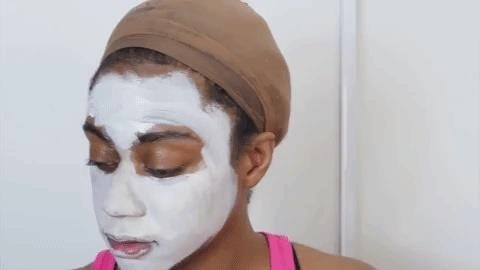 While waiting for it to dry, apply white face paint to the rest of your face thickly with your biggest brush, before covering the cap/latex seam with face paint as well. 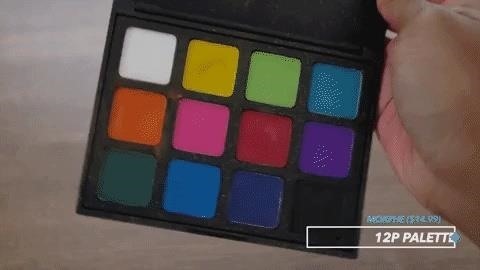 While the white paint is still slightly wet, add some black face paint to your eyelids and blend it evenly to achieve a gray eyeshadow effect. Carefully draw eyebrows and tear streaks using black face paint. To keep the lines crisp, wait for the white paint to be completely dry, and then paint the lines in with a single confident stroke. 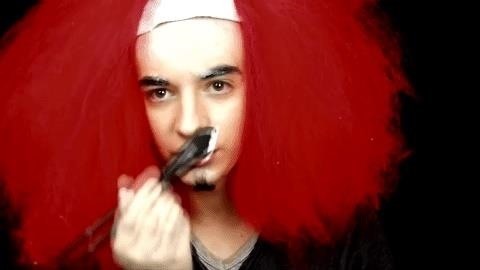 Apply a thick coat of red face paint to your lips and nose — don't forget the underside of the nose and around the nostrils, as that will give your clown nose its rounded quality. You might want to practice your most gruesome smile in the mirror, but pop in your fake teeth, and you're done with this 1990s Pennywise costume! If you can't rustle up a clown outfit, just wear lots of gaudy, mismatched colors, with lots of yellow, purple, and green. If you want to go all out with a more advanced homemade costume, follow this step-by-step walkthrough of Timeloveslemons' 2017 Pennywise. Use the glue stick to flatten your eyebrows completely. This will allow you to hide them completely with face paint so you can draw Pennywise's new, devilishly arched ones. Then apply thick white face paint over your face and neck, covering all skin completely. Either put on a wig cap or slick your hair back, according to what's appropriate for your hair type. 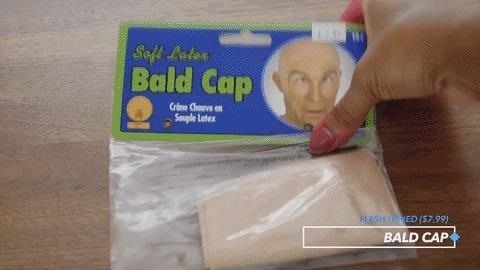 Then put the bald cap on, followed by your wig. Now for some papier-mâché. Separate your tissue paper into one ply, and add a small piece coated in liquid latex where the seam of the cap meets your forehead. Repeat until bald cap blends imperceptibly into your forehead. 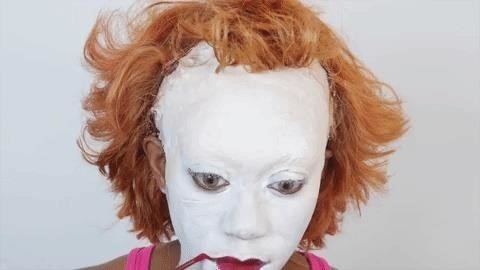 Go over the forehead and seam especially with white face paint. Apply a thick coat of red face paint onto lips for a vivid look. Carefully paint on Pennywise's Glasgow smile with a brush. To achieve crisp lines, make sure you have a generous amount of paint loaded onto the brush and execute a single, confident stroke. Paint the base of your nose red, including around the nostrils. 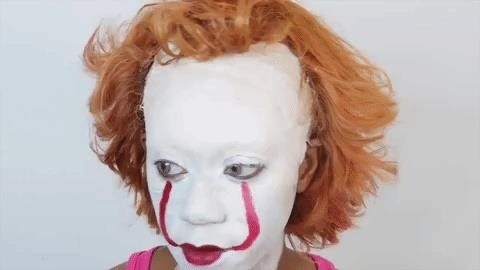 Using liquid eyeliner or a thin-headed brush and black face paint, draw Pennywise's arched eyebrows. 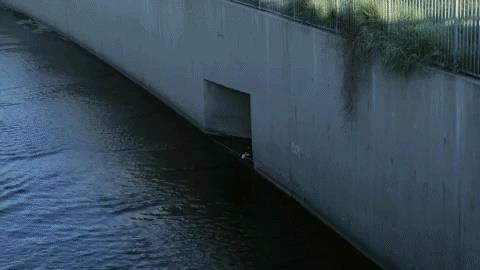 Again, for a clean look, you need to have a generous amount of paint and a single, confident stroke. Then add a small amount of black face paint to your eyelids and use a brush to blend it into the gray color in the image below. Alternatively, you can use black or gray eyeshadow. 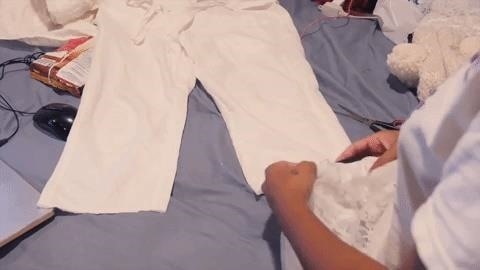 Cut up the tutu or ruffled material you have, and hot glue the material to your shirt and pants. 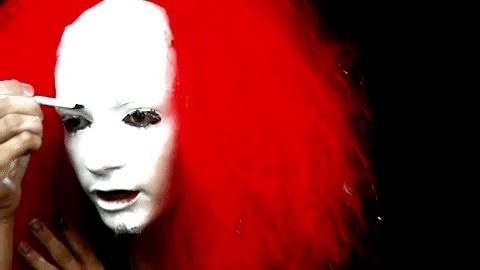 While a haphazard approach will work for this scary clown, you definitely want lots of material around the neck, shoulders, wrists, and pant cuffs to clearly resemble Pennywise. Then glue three red pom-poms onto the shirt front like buttons. Last steps: pop in your yellow contacts, mess up your hair with a little product, slide on some white socks and shoes, and you're done! If you want to accessorize, carry a helium balloon around to mask your face before releasing it slowly (don't fill it completely with helium if you want it to rise more slowly and dramatically, say when you enter a room). 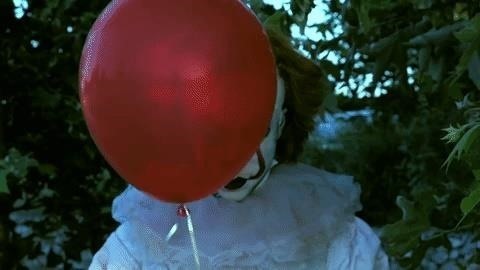 As with the 1990 Pennywise, make sure you practice your creepiest smile! 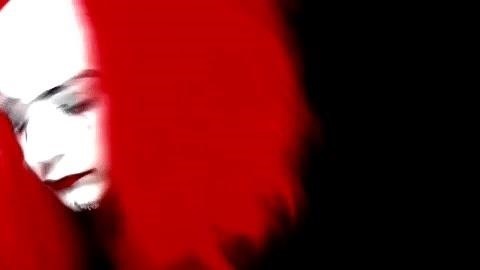 Did you manage to crank out a quick 1990s Pennywise, or did you labor through the 2017 Pennywise tutorial? Let us know how your costume turned out in the comments below!